You can put plastic #7 bottles, tubs and jars in your recycling. Other plastic #7 items should be put in the trash. 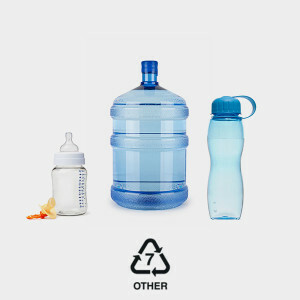 Biodegradable and vegetable-based plastics are often labeled #7, but are not recyclable and should be put in the trash. One plastic #7 called polycarbonate, a hard plastic that appears to be almost as sturdy as glass, is known to contain Bisphenol A (BPA). BPA is a chemical that mimics estrogen and causes many health and developmental problems. When buying plastic #7, check for a “BPA Free” label to ensure your health and safety.